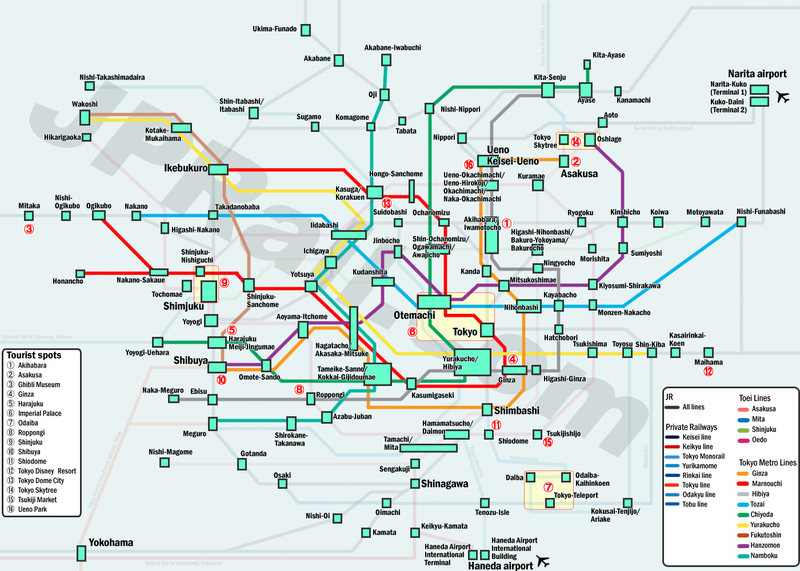 I show you all subway lines, all JR lines and most of major private railway’s lines in downtown Tokyo on this map. 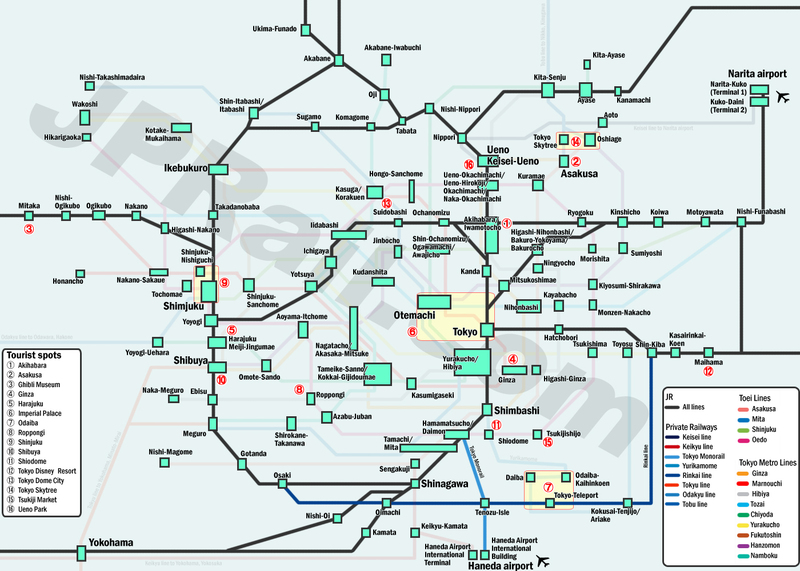 But there are too many stations to show in this map. 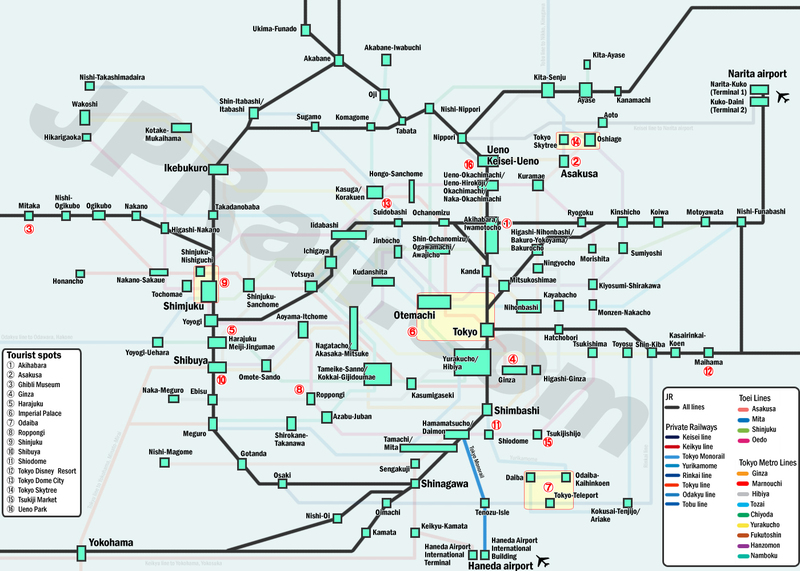 Only major stations, junctions and the nearest station to major tourist spots are shown in this map. When you visit the tourist spots in Tokyo, such as Shinjuku, Ueno, Harajuku, Ginza, Asakusa, Skytree, Odaiba, Tsukiji Market, you have to find the locations, the nearest station and route. And you can choose your deal to visit these places. If you will use JR Pass, JR East Pass, Tokyo Wide Pass or other regional pass, you have to make sure the coverage of your pass. And you will find the additional fare on top of these pass if you visit the place where is not covered by your pass. You can take all railway’s trains in the map above. IC card makes your trip be very easy. You can tap your card when you enter and exit the ticket gate. But it does not give you any discount. If you intend to make many train trips, unlimited ride pass, such as subway pass is cheaper. I would like to show you the coverage of major deals one by one from next chapter. JR train network in Tokyo is much more simple than subway network. There are only three major lines that you need to know. Those are Yamanote line (loop line), Chuo line (Tokyo-Shinjuku-Mitaka), and Keiyo line (Tokyo-Maihama). you can access to many places in Tokyo by JR train only, such as Akihabara, Ueno, Ikebukuro, Shinjuku, Harajuku, Shibuya, Shinagawa, Mitaka and Maihama. Some of you are thinking about using JR Pass, JR East Pass or Tokyo Wide Pass. These deals are national or regional deals and those cover Tokyo and many more areas. You can use these passes to take JR trains in downtown Tokyo. But using these deals while staying in Tokyo, please understand that the base fare to travel within downtown Tokyo is quite small. For example, the base fare for Tokyo to Shinjuku by JR local train is only 200 yen. Mostly base fare is around 200 yen. Traveling by these passes do not help to get worth very much. If you have any other trips to be covered by these passes, you should use the pass for other trip. This pass covers JR trains and Tokyo Monorail (Hamamatsucho-Haneda) only. Subway and other private railway lines are not covered. This pass covers JR East service area, such as Tohoku, Niigata, Nagano, Tokyo and surrounding area. Please see the map below to find the coverage of this pass. This pass covers JR trains, Tokyo Monorail (Hamamatsucho-Haneda) and Tokyo Waterfront Area Rapid Transit Rinkai Line. Rinkai line can take you Odaiba. This is only and the biggest difference between JR East Pass and JR Pass. Subway and other private railway lines are not covered. Rinkai Line will not be covered. You cannot get Odaiba by new JR East Pass. Tokyo Wide Pass covers Tokyo and surrounding area for 3 days. Please see the map below to find the coverage of this pass. This pass covers JR trains, Tokyo Monorail (Hamamatsucho-Haneda) and Tokyo Waterfront Area Rapid Transit Rinkai Line. Rinkai line can take you Odaiba. This is a big benefit for sightseeing in Tokyo. Subway and other private railway lines are not covered. 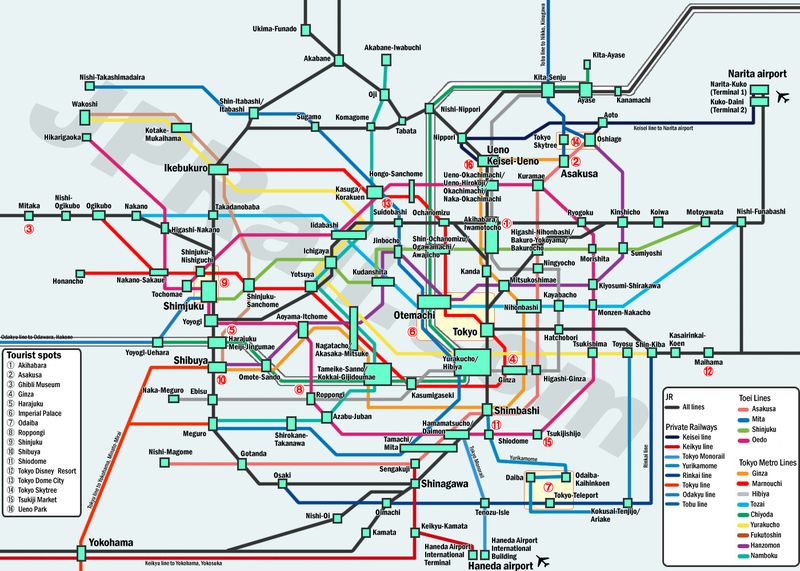 Subway lines network in Tokyo is very complicated but it is most convenient train system in Tokyo. It covers whole part of Tokyo and you can go almost anywhere in downtown Tokyo. Therefore understanding subway system is a key to travel in downtown Tokyo smoothly. First of all, please see the all subway lines in the map below. You may have already noticed that different name stations are located at same place. For example, Yurakucho and Hibiya are same location and you can transfer these subway lines very easily. We can find same thing in JR and subway stations, like Hamamatsucho and Daimon, Mita and Tamachi. Actually there are two different subway companies, Tokyo Metro and Toei Subway. There are many kinds of subway passes available. Before choosing the deal, you have to know these subway companies. First, Tokyo Metro operates nine subway lines. Please see the map below. Toei Subway operates only four lines but Oedo line gives you direct access to Tsukiji Market. Tsukijishijo station is the nearest station to get there. And Asakusa line is very useful because this subway line gives you inter-connected through service with Keisei line from Narita and Keikyu line from Haneda. I will tell you this shared track service later. Now I would like to show you subway deals. 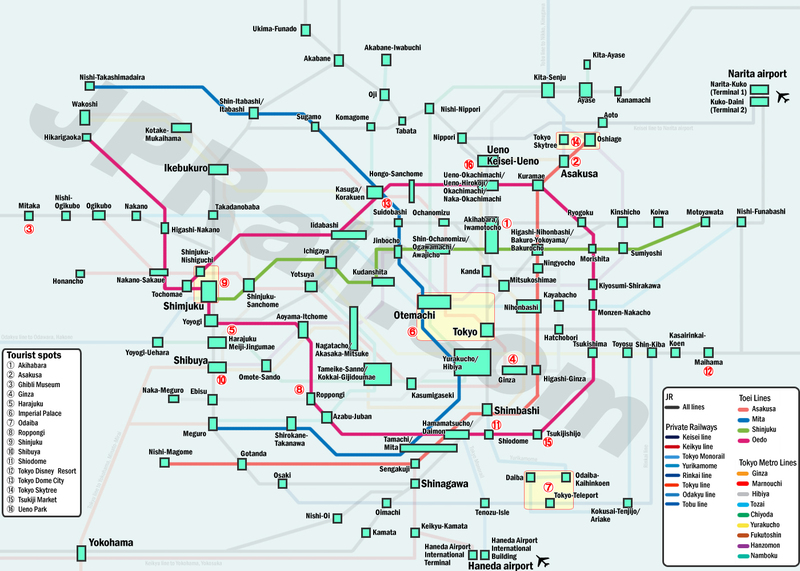 This covers both Tokyo Metro and Toei Subway lines. The coverage is exactly same as Tokyo Subway Ticket above. But the price is a bit higher. It is 1000 yen for one day. Only one day pass is available. This pass can be purchased at any subway subway stations. You can purchase it at even vending machine. Average subway fare is around 200 yen. If you make 5 or more trips by subway, this pass is cheaper than single fare or using IC card, like Pasmo, Suica. This deal covers Toei subway lines and other public transportation by Tokyo Metropolitan Government. The price is 700 yen for one day. If you make 4 or more subway rides, it is paid off. But you can take only 4 subway lines. 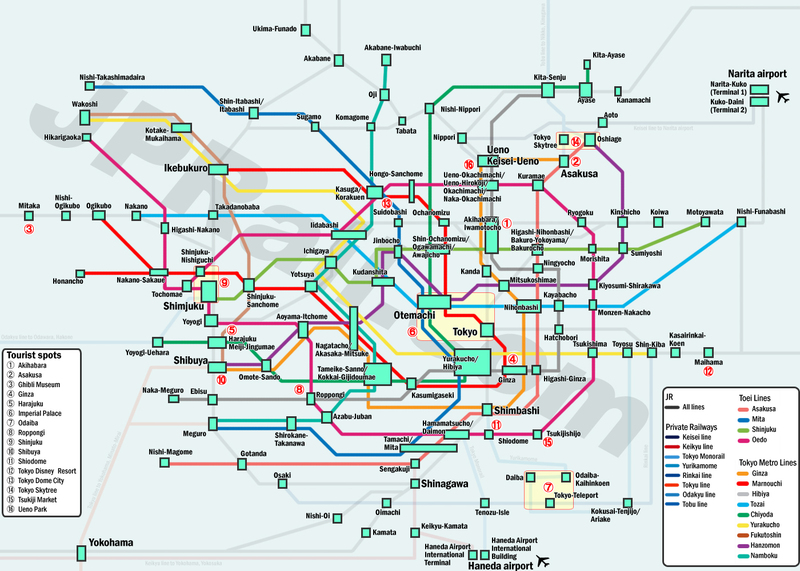 This deal covers all lines of Tokyo Metro 9 lines. The price is 600 yen for 24 hours. This deal has bigger coverage area than Toei subway deal above but the price is cheaper. You may be able to get the worth by 3 subway rides. There are some combined deals, like JR and subway, airport access train and subway. This deal is called by several different names but it is same. This covers all subway lines and JR lines in Tokyo 23 wards. So it is combined of Toei Subway and Tokyo Metro Lines Common One-Day Economy Pass (1000 yen) and Tokyo Tokunai Pass (750 yen). But the price of this deal is 1590 yen. Actually this is not easy to get the worth of this pass. You have to make train trip at least 8 times. If you visit many places in one day and need to take both subway and JR trains, this pass will work. Otherwise this is not recommended. You may find the detailed information and conditions at JR East official site. There are many types of deals for travelers who arrive at Haneda and Narita airport. Keisei railway (Narita), Keihin Kyuko Railway (Haneda) and Limousine bus (Narita/Haneda) offers transportation to downtown Tokyo and subway pass combination deal. Please find more information at Tokyo Metro official site. There are many many train lines in Greater Tokyo. And also many train companies share the track for the commuter’s convenience. Since trains come from outside city go through subway into the center of Tokyo, commuters can get the work place by minimum transfer. This is “Inter-connected through service”. This makes you be confused. For example, JR train goes through subway line and JR train run on subway track as subway train. Do you understand what I mean? If you cannot understand it at this point. it is okay. I would like to show you some inter-connected services in this chapter. If you understand these services, you can get the place where you want quickly and less transfers. This route is probably most useful route for overseas travelers. Keisei Railway, Toei Subway Asakusa line and Keihin Kyuko Railway share the track. Some train connect Natita airport and Haneda airport directly via Oshiage (Tokyo Skytree), Asakusa, Higashi-Ginza, Sengakuji and Shinagawa. If you stay the place along subway Asakusa line, such as Asakusa, Ginza, this route takes you the place to stay directly. This is the easiest way to get Odaiba from Ikebukuro, Shinjuku and Shibuya. JR Saikyo line train runs on same route as Yamanote line to Osaki. (But Saikyo line train skips several station on Yamanote line.) JR Saikyo line train goes through Rinkai line to Shin-Kiba via Tokyo Teleport (Odaiba). Rinkai line is not JR line but it is operated as a part of Saikyo line. All JR Saikyo line train run on Rinkai line. But Rinkai line is covered by only Tokyo Wide Pass. Other JR deals do not cover Rinkai line. But if you intend to use Hakone Free Pass, you have to purchase the pass in advance because this pass is sold at Odakyu Railway station. You cannot purchase it at any subway stations. In this case, you have to purchase Hakone Free Pass from Yoyogi-Uehara. 2 days pass is 5140 yen and 3 day pass is 5640 yen. This does not include subway fare. You can purchase subway ticket to Yoyogi-Uehara. On the way back, you can pay extra charge for subway when you exit subway station. You can show Hakone Free Pass and subway station staff can understand you need to pay the fare from Yoyogi-Uehara. Iwatamotocho station is not located in the center of Akihabara. But it is only 5 minutes away from JR and Hibiya line Akihabara station. You can access to Akihabara easily. All stations are located in the center of Asakusa. Senso-ji temple is very closed from these stations. There are many stations in Ginza area. Even if you have only JR deals, you can access to Ginza from Yurakucho station very easily. Tokyo Metro Meiji-Jingumae stations are located at same place as JR Harajuku. Imperial Palace is a huge place and you can access from many stations. You should check which part of Imperial Palace you will visit before you go. There is no subway and JR stations in this area. Any subway and JR deals do not cover Odaiba area. Only Tokyo Wide Pass by JR covers Rinkai line to get Odaiba. Yurikamome has one day pass but it is too expensive to have only round trip to Odaiba from Shinbashi. If you have Suica, Pasmo, ICOCA or other major IC card, you can use it to take both Rinkai line and Yurikamome. Shibuya is one of the hub stations in Tokyo. There are five stations but actually four station because Tokyu Railway (not Tokyo Railway) share the track with subway. Shinjuku is the busiest station in the world. Seibu Railway and Keio Railways are not shown in the map. These are major private railway lines in Tokyo. Suibu-Shinjuku station is a bit away from other Shinjuku stations. Keio Railway has two stations in Shinjuku. This railway shares the track with Toei Subway Shinjuku line at one of these Shinjuku stations. Shiodome area is connected with Shinbashi station by shopping arcade. It is 10 minutes away from Shinbashi by walk. The entrance of Disneyland is very close from Maihama station. You can also access to the gate of DisneySea by walk. But it is about 15 minutes walk away. You may take Tokyo Disney Resort Line (Monorail) to get these entrance. You can also find the access information at Tokyo Dome City official site. There are actually three stations because of shared track. There are only two “Oshiage” station. If you go to Tobu Railway Oshiage station, that is also Tokyo Metro Hazomon line Oshiage station. If you go to Keisei Railway Oshiage station, it is Toei Subway Asakusa line Oshiage station. Tobu Railway has two stations near Tokyo Skytree. You can access from these two stations. You can access from both stations. But if you want to go to the inside of market, Tsukiji-Shijo station is located just next to the market and much closer than Tsukiji station. If you go to Tsukiji to eat fresh seafood, you can access from both stations easily. Ueno is also one of the hub stations in Tokyo. But it is much easier than other hub stations, like Tokyo and Shinjuku. All stations are located in same place. Ueno Park is located just next to the station. Need your help whether i will need a tokyo subway pass or not for my below trip and is the sequence correct or not. All places are covered by Tokyo Subway Ticket. By the way Tsukiji market moved to Toyosu in last October. You have to take Yurikamome line from Toyosu. Yurikamome line is not covered. Thanks for ur input takeshi san. Can you advise what transportation to take from Conrad hotel to haneda airport? I have mid morning flight. Does any direct train goes to Haneda? Or is it better to take a bus? We are on a budget . Also the tsukiji market is still there right? Even though they already moved. There is no direct trains. Limousine bus is better way. Tsukiji Market has been moved already. There are still lots of shops and restaurants in Tsukiji. But the market itself was moved to Toyosu. Can you suggest which pass is the best deal ? This is an excellent guide. Even though I have been in Tokyo numerous times over the last 30 I found this very useful, especially with the separate maps for JR East pass, private lines and subways. Thank you very much Takeshi-san! Happy 2019 and thank you for such an informative and wonderful website! I have been learning a lot. I will likely be making my 1st trip to Japan soon but I am still a little overwhelmed on the various passes. Below is my planned route. 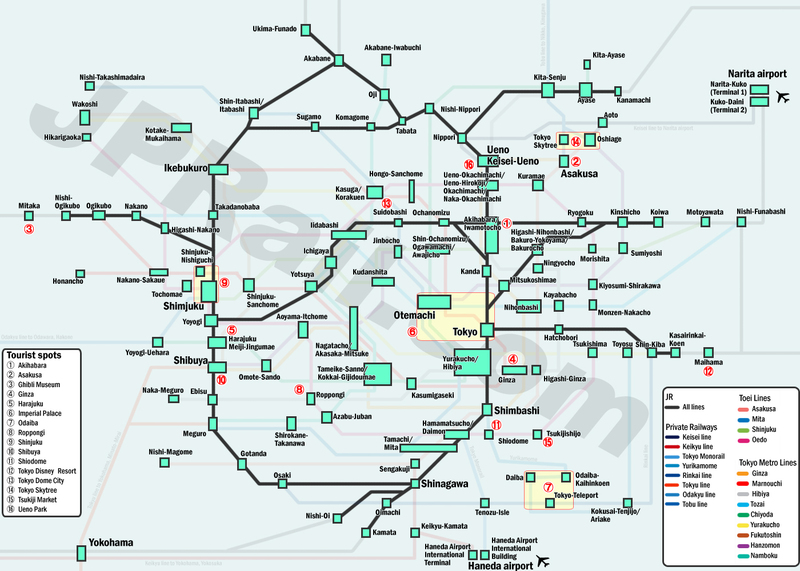 May I seek your advice whether my route is reasonable and whether a 7-day JR pass is ideal? Thank you! You may use JR pass 7 days. If you leave for Takayama on day 4, you can use JR pass 7 days from day 4. It will cover your trip until the end. If you move to Takayama on day 3, you can start using it on day 3. Next Next post: JR East-South Hokkaido Rail Pass user guide. Perfect deal for the travelers who visit Tokyo and Sapporo by train.